At Total Events we have been lucky enough to develop lasting relationships with our clients. Whether we’re working with a corporate event planner on their annual gala, or a former bride who asks us to help with all of life’s celebrations, we feel fortunate to build these relationships and in some cases, those two worlds collide. One of our favorite weddings of the summer, was the daughter of one of our long time corporate clients. The bride, Marissa, knew she didn’t want the usual Hall of Springs wedding; she wanted an event that would be unique and memorable. We collaborated with Marissa and her family, their wedding planner (Katie O Weddings and Events), and their florist (Surroundings Floral Studio), to create a stunning event unlike any other at the Hall of Springs. 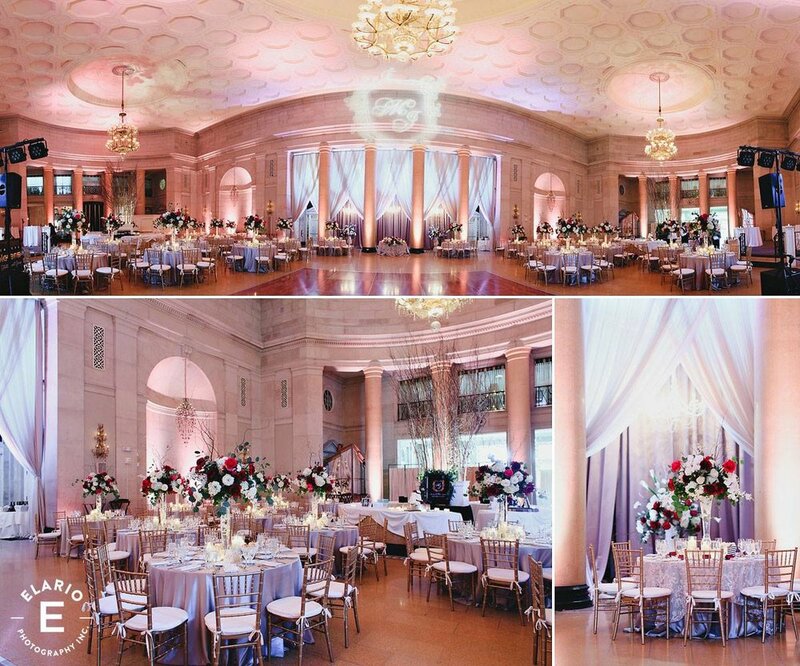 In order to transform the Hall of Springs to reflect Marissa and John’s vintage Tuscan style, we selected colored drape as opposed to the traditional white or ivory which created a dramatic first impression. This custom selection added dimension to the space when we layered the fabric on the columns with different lighting options and vintage chandeliers. For a cohesive look throughout the space we had to continue to customize! To match the drape, we purchased fabric to create custom table linens. Our specialty linens from The Collection were also featured throughout the event, including the head table! For the outdoor wedding ceremony, the June weather was up in the air and the forecast changed from rain to one of the warmest days of the summer. Although the ceremony tent was initially just in case of rain, the team decided to keep the ceremony tent for the comfort of their guest no matter which way the weather decided to turn. 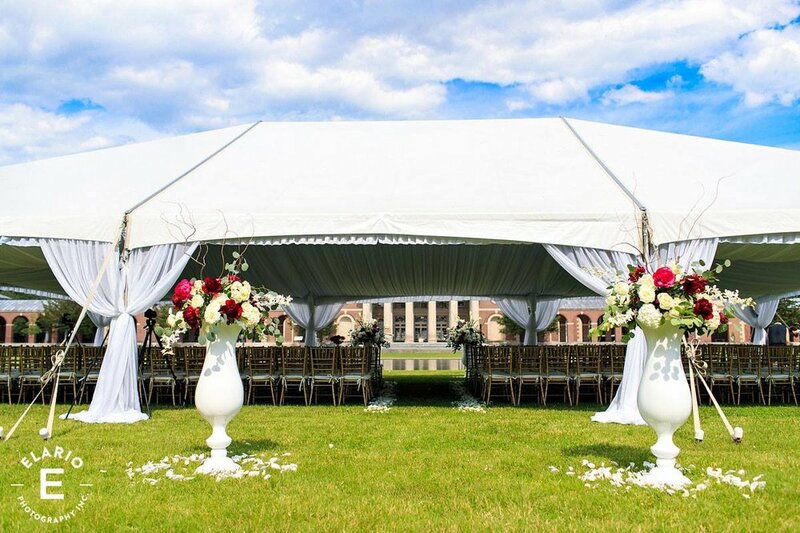 The Total Events frame tent with white liner ended up being the perfect shaded ceremony space for guests to witness Marissa and John become husband and wife. Now, we would be remiss if we forgot to mention one of our favorite pieces from this event, the burgundy settee. When Marissa came in with the picture of the settee she was envisioning and how it would bring her Tuscan vision to life, we knew we had to get it. 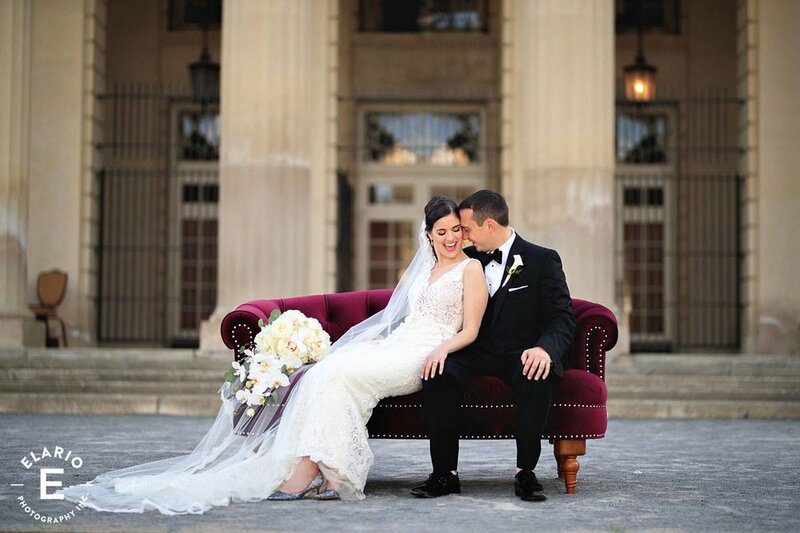 Now christened, “The Marissa,” the burgundy settee not only became the most picturesque prop for Marissa and John’s one of a kind wedding photos, but was also used at their sweetheart table. To finish off this Total Events Transformation, Marissa and John had a custom monogram gobo light over the head table and uplighting washed the room to enhance the beautiful stone throughout the Hall of Springs. We cannot thank Katie O Weddings and Surroundings Floral Studio enough for helping to bring this event together. From start to finish, our teams worked to truly bring a sense of Tuscany to the Hall of Springs for a special family.